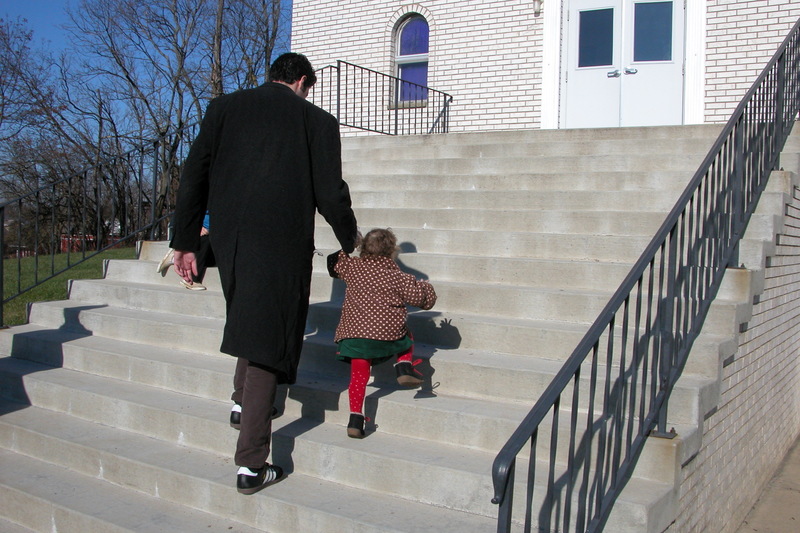 Yesterday we left the city sparkling in the bright December sun and traveled to a tiny country church with the steepest set of steps I have ever seen. We were there for the baptism of our godson, Gideon Josef. Gideon is a remarkably peaceful, contented, and quiet child. This makes him distinctly different from his two year old sister Avila and my daughter Olympia. Actually Avila wasn’t so bad, but as for my child… Well. Any of you who have stood in front of a silent congregation holding a very vocal and squirming toddler can probably understand why I have claw marks on my face and neck this morning. I was fiercely engaged in a silent and public wrestling match with Olympia while standing in the front of the church before the baptismal font, until finally recognizing that she fervently wanted to be reunited with Avila, and gratefully surrendering her to the grandparents in the front pew. Meanwhile, the priest dropped his cane, and Gideon threw out his arm to ward off the holy water and knocked the vials of chrism oil onto the floor. 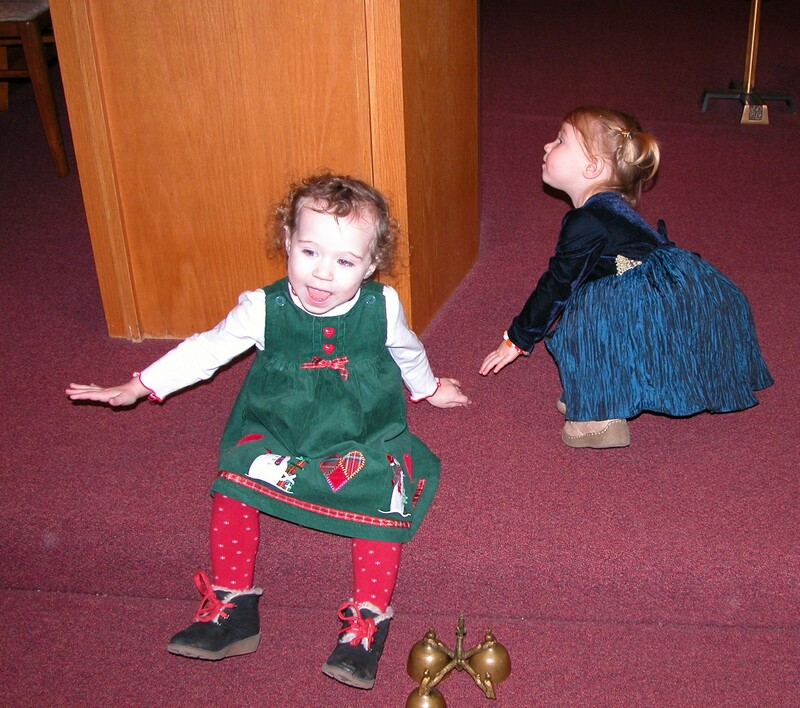 In the end the cane and chrism were retrieved, the toddler was pacified with a camera, and the baby was duly baptized. Then there was cake, and time for the little girls to run wild. Note Avila’s truly fantastic fur coat. The friendship between these two little girls has been a delight to watch. They have always had a special connection. It was interesting to watch an affinity so clearly pronounced between tiny babies. They are just getting old enough to do more than stare delightedly into each others eyes. I suspect this means they are on the verge of getting into a great deal of trouble. They come by the friendship, fur coats, and propensity for trouble making honestly enough, as their mothers have spent many years dressing up, dreaming, and getting in and out of trouble together. Granted we weren’t usually that dressed up. That picture was taken at the in the midst of the time we spent living in a blue cabin and running a theatre company together. Rebecca made all the costumes, so the cabin was full of them, and moments like these flowed out of our daily life. 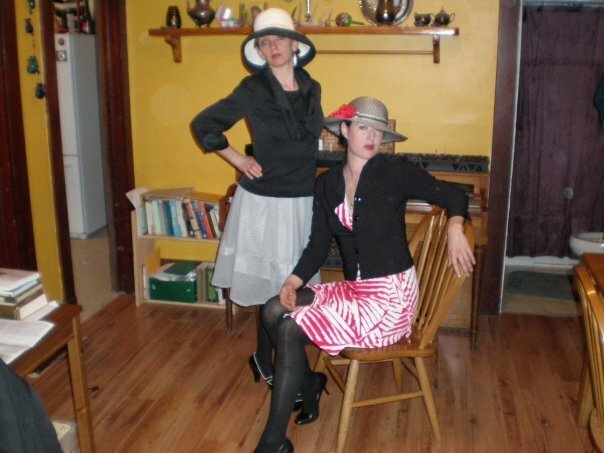 Of course, our daily lives tend to lead to dress up on a regular basis. I am delighted to see the friendship (and the dressing up) continuing in the next generation. 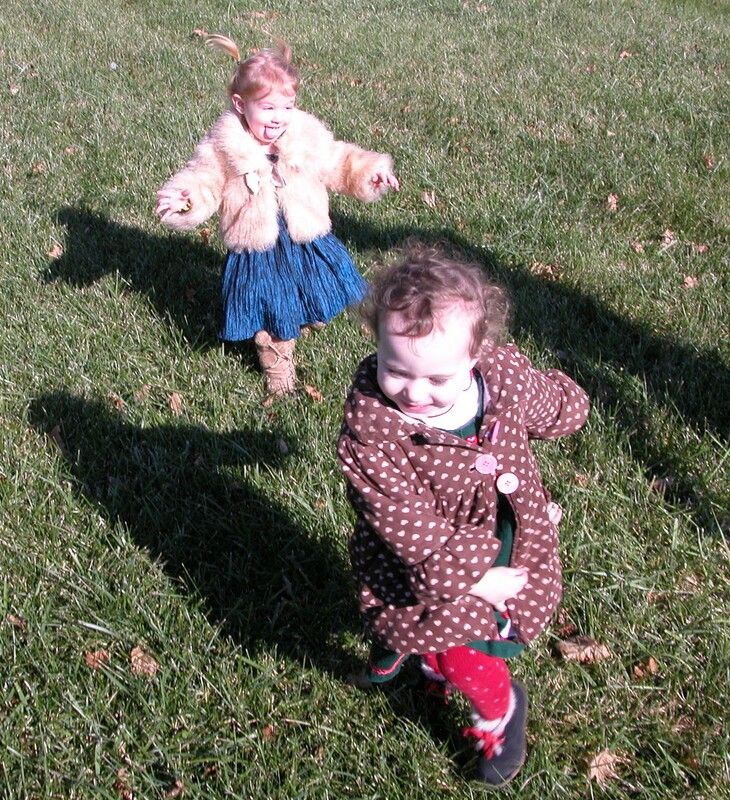 This entry was posted in Kate and tagged Church clothes, dress up, Friendship, Motherhood, style on December 12, 2011 by sweetridgesisters. I love that your little girls are starting to have that connection that you and Rebecca have–I can only imagine how much fun that is to watch! Aw, girlfriends are great, aren’t they? You really captured the essence of Av and O in those pics, Kate – I love this post. hey kate! i’m 47 now but went to a performing arts hs and still love the theater and all the arts. blogging is a great creative outlet. the little ones are adorable. don’t worry the claw marks and the priest both heal. i’m glad it turned out fine. enjoy your little ones. mine are 10 and 14, and they are still lovely, but not dressing up much (except for rare occasions). happy monday! How joyful. I especially like the last picture with little hands reaching up to a strong adult one.